"A friend had been trying for a couple of months to get me to come along to Ron’s Fitness 4 U group training sessions and group boxing sessions. Finally the nagging worked just over a year ago and I started coming to group boxing and group training sessions at Ashgrove. After a couple of months I started to see real results and liked what I saw. Now I am thoroughly addicted and try not to miss one of my regular sessions. I am now also a serial boot camper. 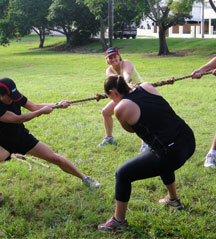 It is great to train outdoors with friends in a group with the advantage of a trainer always close by to encourage and challenge when it is needed. It is also the most affordable fitness option available. Just over 12 months down the track I am fitter, stronger, slimmer and much happier with myself"
"Three things have made Boot Camp a must for me for the past five years: the variety of challenging exercise routines over the course of each boot camp, the challenge of exercising in the great outdoors in all weather conditions and Ron’s unique “challenge by choice” leadership of the groups. I am one of the golden oldies of the group, a fitness enthusiast from way back and I wish I’d discovered this form of exercise sooner. Take the leap of faith and join a really supportive group in whose company you will enjoy getting fit." "After having my third child my husband encouraged me to get out of the house and do something for myself. 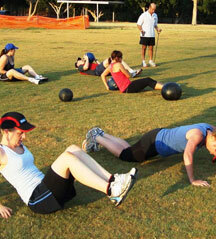 I looked up outdoor boot camps on the internet and found a 5:30am Fitness 4 U session 5 minutes from home. 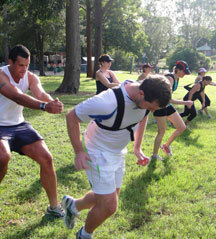 After attending a couple of boot camps I discovered there is no better way to start the day than working out in the park with a bunch of fun and friendly people. Ron caters for all levels of fitness, he knows how to work each person to their limit and the variety of workouts is endless. Two and a half years later I am still there twice a week and loving it.” "
"Some friends of ours were raving about a boot camp they had recently joined to get fit. We decided to give it a go after a chocolate filled Easter weekend. One year later and we're still going twice a week. We love the variety Ron offers each session and it feels like every part of our body gets a work out."